We just opened our pop up shop at 3224 11th St NW in Columbia Heights. We wanted to introduce ourselves to you and your community. 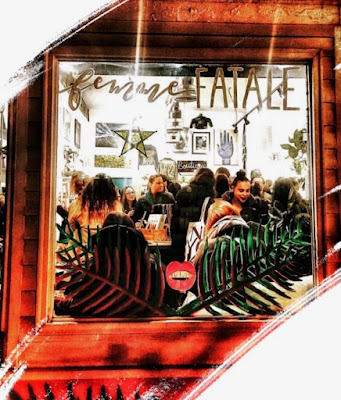 We are Femme Fatale DC, a platform for womyn creatives and entrepreneurs to collaborate in sharing their passions. We build meaningful friendships through creating spaces & experiences that amplify, foster and sustain an ecosystem of womyn who empower each other. We just opened our forth pop-up shop featuring over 30 different local womyn entrepreneurs and artists. We are so excited to be in the Columbia Heights neighborhood and have been loving it. We have a bunch of upcoming workshops that we would love to invite the Columbia Heights neighborhood too. Felted Succulent Workshop with Rock Paper Plant- April 4th 6:30-8:30pm- Do you want a houseplant without the hassle of actually keeping it alive? Felted succulents can in survive even the most inhospitable climates and look really cute on your desk. In this two-hour class, you’ll learn the basics of how to create felted structures all while creating your very own needle-felted cactus. Tipsy Terrariums with LOVERS Plant Studio- April 5th 6:30 - 8:30pm- Emily will guide you through the process and art of creating a beautiful and lasting container garden- a sweet micro-environment that is super easy to maintain! Emily will share her tips for terrarium design, planting, and care. Pout for a Purpose with LIPP Beauty- April 7th 4-7pm- Join LIPP Beauty for an event benefitting the Alzheimer's Association. 100% of your $10 ticket goes to directly to the Alzheimer's Association and you get a $10 coupon to shop LIPP Beauty's cruelty- free lipstick line. Full Moon Circle: Myth Busters with Untethered Strength April 22nd 7-9pm- Join Untethered Strength for a Breathwork Meditation. We will discuss our personal myths- the stories that we tell ourselves, the thoughts and beliefs that we incorporate into our actions on a daily basis (sometimes subconsciously). We will discuss ways to dispel these myths followed by a Breathwork Meditation to release negative thoughts, patterns, and habits from our bodies. We have wifi and invite anyone into the shop to come do work, chat, or just relax.